The Adda River is only a small mountain creek when it leaves the small lakes of Alpisella, just over Livigno, at 2235 metres above sea level, andpass through Valtelline, from Bormio to Colico. After having crossed Lake Como for 42 kilometres, it takes the form of a large river in Lecco, south of which it forms two small lakes; Garlate and then Olginate. The Adda River slopes steeply a.m. ong the rocks below Brivio. After Paderno, the river enters a sort of a “canyon” washed between banks of stone and then enters the Lombardy plains. The first Adda bridges’ battle was fought around the 268 B.C., a clash between the Roman factions of Mark Acilio Aureolo and of Galliano. 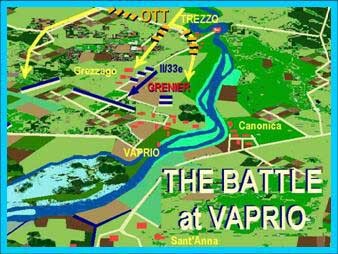 Close to the bridge that connected Vaprio with Canonica on the other side, the rebel army fought the regular army. Aureolo was then killed in Milan by his own soldiers and buried near that bridge which beca.m. e the Bridge (Pons) of Aureolus, which evolved into Pontirolo. The “Pax Romana” was short and the invasions from the north followed. In 1158 Brescia and Bergamo claimed the Emperor’s Frederick the Barbarossa’s help against Milan. The Holy Roman Empire Chief used the pretest in order to send his forces into Italy. The Milanese used this occasion to fortify the banks of the Adda River, reinforcing them between Trezzo and Cassano, which protected commercial traffic towards Bergamo, Brescia, and Venice. The bridge was defended by a castle since the 9th Century. Barbarossa first captured Cassano, as part of his strategy to control all ways that could have guaranteed his return to Germany , and then destroyed the castle. The “Condottiere” Ezzelino 3 of Romano, who cultivated the drea.m. to constitute a large Lordship over northern Italy , found on the river an invaluable stop. After having crossed the Adda on the Canonica bridge, he occupied Vaprio, then headed directly to Milan. At that city he was repulsed and forced to withdraw towards Trezzo which was burned. The final battle occurred on the bridge of Cassano in order to decide if he had to withdraw or not. It was a bloody battle. Ezzelino was wounded and taken prisoner by the Milanese. During the War of Spanish Succession there was the first battle of Cassano between Spain and Austria , in 1705. That Italian ca.m. paign concluded with the Peace of Utrecht which assigned the Milan Duchy to Austria . From then begun a long period of Austrian dominion that lasted until the arrival of Bonaparte in 1796, whe the French pushed the Austrians towards Milan and defeated them at the bridge of Lodi. The ca.m. paign was very difficult due to the natural obstacles of the land. Napoleon himself stated that the Adda was the most defensible river in Italy . Trezzo. The town of Trezzo (on the Adda) is firmly linked with Leonardo da Vinci, who lived in there. The Master designed the projects of the Adda’s locks and calculated the flow of the Martesana channel to allow the boats from Lecco to reach Milan . The Visconti’s Castle is the symbol of the town, a village of ancient origins situated northeast of Milan. It was constructed in 1300, by count Bernabò Visconti, near the mansion which the tradition assigns to Longobard Queen Teodolinda. This fortification has witnesses numerous fights and siegesover the centuries. Today, a.m. ong the impressive castle ruins, remains the square tower, 42 meters high, and basements. There is also the remnants of a bridge over the Adda, destroyed in 1416 by Carmagnola -- its shoulder still visible. In 1799 no bridge was there. Vaprio. The Lombardy country land, where Vaprio is touched by the Adda River, was known, in the past centuries, as "the most beautiful garden in Italy ". 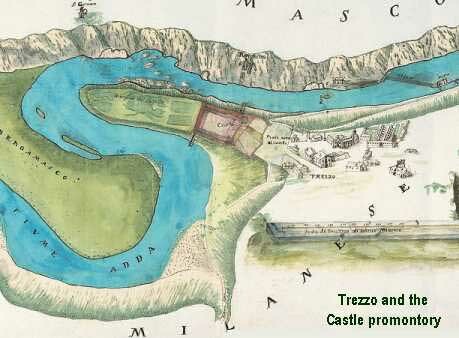 From the 1400s on, there were many luxury estates (Villas) such as Villa Melzi, a splendid exa.m. ple of a rustic country estate. Vaprio was crossed by the Martesana Channel, like other ha.m. lets of that land. Milanese gentlemen, attracted by the land and the surrounding forests, were often seen there moving along the water-channels by boats. Austrian Empress Maria Theresa, in 1763, declared the beautiful environs of Vaprio as her personal hunting place, above all because the Duke of Modena, an Austrian Lombardy administrator, had set Vaprio village as his own holiday place. Near the ruins of an old Roman stone bridge (they say erected by the Emperor Claudius) Vaprio had a wooden bridge to cross the Adda River, at that time da.m. aged by the French. The Martesana Channel ran approximately forty meters south of the village and had high banks to protect houses from floods. After a reconnoissance with the jäger Colonel D’Aspre, Chasteler, who was with Suvorov in the second Austrian Avantgarde, decided to build a pontoon in front of San Gervasio (north of Trezzo). Here, between San Gervasio and Trezzo, the river squeezed resulting in a 50 meter large flood plain (but only 6 feet deep) which presented a double curved course (like an “S” letter). On a promontory, emerging out of Trezzo, was the renowned Visconti castle. Twenty German Jägers crossed the river on boats deploying on the opposite bank to secure the works. The pontoon convoy arrived late, at 11 p.m., from San Pietro. It was stopped far from the river and the transports were carried on by Banater’s Croats and D’Aspre jägers. Chasteler ordered the bridge secured with strong ropes fixed in the rocky bank, because the river was too deep for the anchors to touch the bottom. Before it was finished, 4 boats crossed the waters carrying 200 Croats and 2 of the Nadasdy Regiment’s companies, who advanced cautiously until they came on the first houses of Trezzo (where the French slept). April 26 was a horrible night. Strong winds continually made obstacles to works, gusts of heavy rain beating the tired sappers. At dawn, (4 a.m.), the bridge was not ready, and was only beginning to be passable at 5.00, when rain ceased and Adda flood became lower. The first to pass was Colonel Constantin d’Aspre with his 6 jäger companies, which took position in front of a French outpost and cleared it with fire. Then followed 1 batallion of the Nadasdy Regiment under Major Pretzer, 600 Cossacks and 1 squadron of the 7th Hussars. They were followed by the main troops of General Ott, along with Suvorov. On May 27 the 3rd Battalion. was in front of Trezzo. Second Lieutenant Ritzko with 50 volunteers and 80 jägers fortified the hamlet of Posto (Pozzo?). 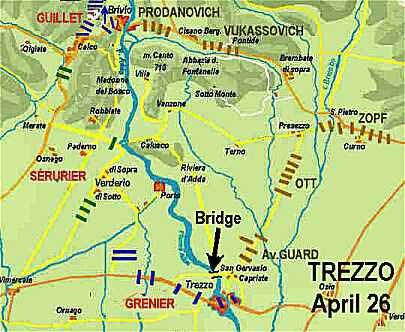 After the boat-bridge was completed the Austrian attacked the French outposts at Trezzo and captured the old Castle advancing against Vaprio to engage Grenier’s division. The 3rd Battalion. took the village with a fast assault with the help of Zoph’s troops. The battalion took 200 French prisoners and had a captain and 50 men killed while other 141 were wounded. Count Freiherr Georg von Stentsch was wounded during the combat at Pastrengo-Verona. He died later, in April, from his wounds. The command was taken over by Count Anton Schiaffinati. K.K. 7th Hussar regiment (no Inhaber) Commander: Oberst Carl Freiherr von Schauroth. With 4 Squadrons. General Moreau, on April 27 at 9.00 a.m., immediately gathered his three divisions north of Cassano. The alarm had been given by the 2nd Battalion 33rd Demi-Brigade, the first to be repulsed by Austrians. The battalion retreated on the road to Vaprio, while mantaining contact with the river bank. In the 70 houses of Vaprio, were the 63rd Demi-Brigade, the first squadron of 24th Chasseurs and 2 guns. Hearing the first gunshots, Moreau jumped on his horse leaving Inzago, who during his ride was attacked by a Cossack squadron. He was able to escape by fleeing and reached Grenier. At 10.00 a.m. Zoph’s Division passed over the bridge of boats at Trezzo and the Austrian reformed their long Columns for the Advance with 25 guns for support. The two battalions were committed to attack the French bridgehead of Cassano. After the success they chased the enemies until night, reaching Gorgonzola town. Oberst Abfaltern and the Oberstlieutenant Pértussy distinguished themselves, the latter commanding the former Korherr Grenadier battalion. I and 2 Battalions. Commander: Oberst Franz Kreyssern. About the 2nd Hussars: Major Dobay with his division was against the left French wing near Vaprio. Oberstltn. Von Hertellendy was with his division was against the right French wing. The latter made three consecutive attacks together with other two divisions of the regiment. The joint attack of the six squadrons pierced the French line (200 French out of combat and 300 prisoners). They advanced until Inzago capturing Moreau HQs clearing Vaprio and Pozzo. The final booty was great: one flag, 12 guns, 1 howitzer, 6 munition wagons and about 2800 prisoners. Oberstltn. Von Hertellendy was awarded with the Maria-Theresia Cross and the commander baron von Knezevich received the same award. The regiment’s losses were high: 153 hussars and 171 horses dead, many the wounded. After the Austrian reorganization on the battlefield the little French contingent had no hope to resist. Moreau ordered the retreat towards the Milan road. Kister and Becker directed towards Gorgonzola, while Quesnel withdrew to Inzago, having the road to Milan cut off by Austrian cavalry. During that retreat coming to help was the first of General Victor’s units: Argod Brigade. After a short combat, in which General Argod was killed, the French army continued the retreat. Grenier camped at Lambrate, near Milan, where he found the 106th Demi-Brigade with another 500 men of all the branches of Service (mainly sappers). 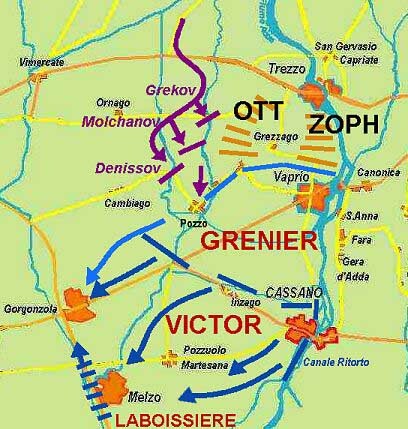 Victor’s division, threatened on its left flank, was not able to prevent the Austrian from seizing the Cassano Bridge; so it followed Grenier on the Milan road where it met Laboissiere, who, while having made a force march, was too late to participate in the battle. Some authors refer also to the participation of the cossacks belonging to Bagration during the final phases of the Austrian Advance, in order to harass the left French flank and to clear the hamlet of Pozzo. 5th Line Demi-Brigade 1st Battalion. Chef Louis-Hyacinthe Le Feron 1st and 2nd Battalions. The Count of Mons was taken prisoner by Austrians at Magnano. Other sources tell he was wounded; another that he led a brigade. Chef de Brigade Georges Mouton - Born: 21 February 1770 à Phalsbourg - Chef de Brigade: 26 May 1798 (99e demi-brigade d'Infanterie)- Chef de Brigade: 14 July 1799 (3e demi-brigade d'Infanterie) - Colonel: 24 September 1803 (3e Regiment d'Infanterie). General de Brigade: 1 February 1805. General de Division: 5 October 1807. Count of the Empire: 19 September 1810. Died: 27 November 1838 à Paris. Pierre Garnier de Laboissière (1755-1809) Grand Officier de la Legion d’Honneur - 14.06.1804. Reformed in 1776, he was recalled on duty, as second-Lieutenant, on June 15, 1777 ; on June 3, 1779 he was Captain, engaged for the replacements organization in the Montmorency-Dragons. When the regiment took the name of 2e régiment de chasseurs à cheval, on September 17, 1791, he followed the unit, as Captain, in the armée du Rhin. At the combat of Spire, September 30, 1792, with twelve chasseurs, he took 300 Austrian prisoners. On the following 1st of December, he was awarded for that action and named chef de brigade. He was a provisional général de brigade in the armée du Rhin, after May 8, 1793, when, after an unlucky charge, where he fell down with his horse killed, he was a prisoner of the Prussians. After the exchange, he was definitevely named général de brigade, then serving under the armies of Rhin-et-Moselle and Allemagne. In 1794 he commanded a Cavalry brigade under the 2nd division - Armée du Rhin. In 1796 he was in the armée d'Angleterre, and then at the Mayence army. On February 23, 1799 he was promoted General-de-division, serving in Italy and Switzerland (years VII, VIII and IX). In 1800 he obtained a command in the Reserve Army, which he mantained until 1801, in the Grisons. Reformed in 1802, he was named "inspecteur général d'infanterie” and entered the French Senate with the direct help of Bonaparte. In 1807 the Emperor gave him the command (March 20) of the 4e légion de réserve de l'intérieur (X Corps) sending him to the Charente. In 1808 he was named Count of the Empire and member of the Supreme Command at Strasbourg. However he did not reach that city because, on March 1809, he died at Paris.